Ever since I’ve started this blog, I can’t remember actually talking about the whole legal side of staying/living in New Zealand. Yes, I’ve talked about living here, what to do, what to eat, but not really about how I got here and why I’m ‘allowed’ to stay. So as part of a little expat community service I thought today I’d talk about visas, but since there are actually a lot of visas options for this country today I’ll talk about the 4 visas Im more familiar with: visitor, working holiday, partner visa and residency. This visa applies for people who want to come to New Zealand to travel and intend to stay in the country for no longer than 3 months. Some countries can visit NZ without needing to apply for this visa, but still need to stay no longer than 3 month, these countries are on a visa-waiver list, which you can find here. If your country is there, you can travel without applying to a visitors visa, if it’s not, chances are you’ll need to apply for one. The fastest and easiest way to apply for one, is doing it online. But if you are unable to do so, you can also apply by paper, sending the application to an immigration office. The first time I travel to NZ, I entered as a visitor. 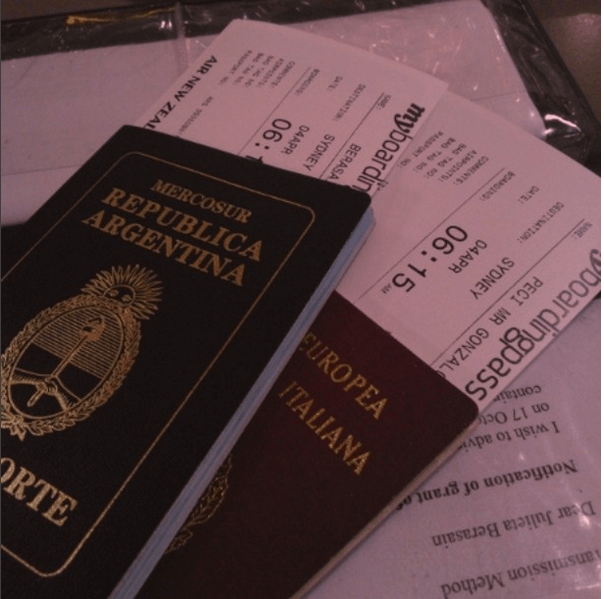 Argentina is in the visa-waiver list which meant I didn’t have to apply to a visitors visa, but when I got to the country I had to provide evidence that I was going to leave the country within 3 months. Evidence such us, plane tickets, evidence that I had sufficient funds during my stay, bookings or confirmations of accommodation, people I knew, etc. After supplying these, I was allowed to enter the country, Im writing this, because that doesn’t mean that because your country doesn’t need a visitors visa, that doesn’t mean you will be allowed into the country. – Working Holiday Visa: The WH scheme will allow citizen from 18 to 35 years old (depends on the country) to come to New Zealand for a series of months, to travel and work (in order to maintain the cost of living here) For Argentina specifically there is an annual amount of people who can apply and get the visa and usually applications open during the month of September and…as expected run out in couple of hours. WH visa holder are not able to sponsor anyone with their visa. Le boyfriend is Italian (or holds an intalian citizenship to be more clear) in the case of Italy, there is no annual quota of people and you can apply at any point of the year, he applied at some point during April and besides the online application, he had to present an italian and argentinian police record, and send a medical examination and x-ray from one of the accepted medicals centers. In his case, his visa was approved within the month and he arrived in the country in October. He applied for a couple of jobs and was offered a position in his line of work from a company who is certified by NZ immigration as ‘sponsors’ which meant, he was sponsored by this company and offered a ‘Work to Residence Visa’ which allowed him to work full time for 2 year, only for that company. If he decided to leave the company that visas would not be valid anymore, so he’ll need to find work at another sponsoring company and had his visa transferred to be entitled to stay in the country. Partner Visa: The partner visa will allow a partner of a visa holding (or resident) person to work in New Zealand for the same period of time as the sponsoring visa holder. This is the visa I applied when I came to work, Le boyfriend being my sponsor, since he was already working under a work to residency visa. To apply to this visa I didn’t need an offer from any company, but I had to undergo standard immigrations procedure to it to be approved. Beside my written application, I had to supply an Argentinian police record to prove my ‘character’, I sat for a general medical check to prove I’m in good health and the most ‘crucial’ part of the application, I had to give sufficient evidence that I was in a relationship with le boyfriend and that we intended to maintain set relationship. So we provided photos of us throughout the years together, with friends and family, bank statements and legal documents that showed we were living together and we wrote a letter with how we met, the reason why we were in NZ and how we were planning to live, etc. I was granted a work visa for two years that expired at the same time as le boyfriend’s and allowed me to work anywhere I wanted. Ok, I think that’s all for now, I hope it can be of help and if you have any questions, ask below and I’ll try to answer them soon, if not be sure to check the immigration New Zealand website. I hope I didn’t forget anything and I’ll see you soon.